With Storm Emma coming in and three layers of clothing on, we’re dreaming of sunnier climes, such as back in July we jetted off with Blanca and Elliot for their Mexico destination wedding at the Sandos Playacar resort. This incredible wedding included a beachside ceremony, so much tequila and the most beautiful nighttime couples shoot. We started our time with Blanca and Elliot by shooting their pre-wedding drinks – something we often do for destination weddings as we love the atmosphere as everyone gets excited. The night before the wedding, friends and family gathered at a beach bar on Playa del Carmen, to catch up before the big day as the sun set. The heat of the sun was just beginning to fade so everyone was able to chill, literally and figuratively, and enjoy the gorgeous surroundings. Early the next morning, no hangovers to speak of of course, the boys started off with an energetic volleyball game in the hotel pool – Top Gun style! What an amazing idea to beat those wedding nerves and Tom had a lot of fun too! Later on the boys enjoyed a little tipple of tequila in the hotel, before heading to the beach for the ceremony. We’re not sure the Sandos Playacar own brand tequila went down so well with best man Steve. While Tom captured the groom and his groomsmen by the pool, Lina headed off to capture the bride getting ready. No sports here, just a fun and chilled morning of champagne, hair and make up – and maybe a few nachos, yum. Blanca chose beautiful Maggie Sottero dress, covered in lace, along with a simple tiara and tousled hair. Once everyone was ready the girls all assembled for a fun photo with the bride, bridesmaid, mother of the bride and flower girl, so cute! Despite a few clouds the weather was toasty but manageable at 5pm, so the wedding took place on the beach, a simple set up that made the most of the incredible blue skies and sparkling white sand. Guest arrived, dressed colourfully and casually, via a walk way surrounded by palms onto the sandy beach. To match the location, the flower girl scattered sea blue rose petals ahead of the bride’s arrival. The ceremony was simple, emotional and full of laughs too. The couple included a sand ceremony, where two coloured sands are combined to represent the joining of two people and two families. So beautiful. The ceremony ended with tiny beach balls being used instead of confetti, so much fun and we’re told this is a Mexican thing! Blanca and Elliot included lots of really personal details in their wedding, like personalised ice pops and a singing groom! Elliot serenaded his friends and family with two songs as they sipped cocktails on the beach, a great way to kick off what was going to be an excellent party. The guests stayed by the water and enjoyed a delicious seafood buffet, before speeches and the cutting of the cake – naturally to the very appropriate number of DNCE’s ‘Cake by the Ocean.‘ Special mention to the incredible dessert bar too, very yummy. Before the day was done we took the new Mr and Mrs away from the crowd for a little stroll further up the beach. As night fell, it was tequila time! And boy did it flow. At once point the bride and groom stood on chairs and poured it into people’s mouths, and we got involved too (forced, obviously!) We’re always in the thick of it! The rest of the night was one absolutely incredible party on the beach – dancing, tequila and even a game of limbo too. As the guests partied we managed to steal the couple away for some romantic night shots on the beach. Then we returned them to the party (still going in the resort club) and so they could dance til the early hours. Blanca and Elliot created a dream of a destination wedding – it was super relaxed and intimate, with plenty of time to have a jolly good party. And who can go wrong with beautiful beaches and tequila on tap? Keep an eye on our blog for part 2 of Blanca and Elliot’s Mexico destination wedding, a super post-wedding shoot by the sea. 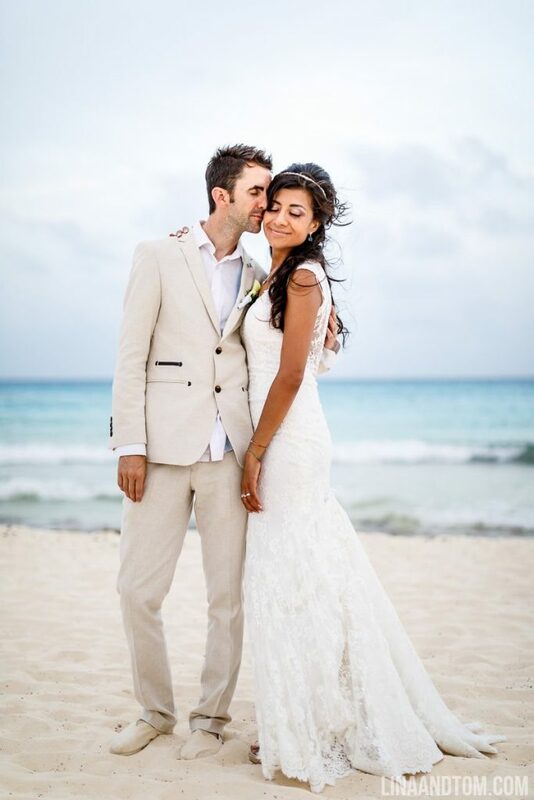 Watch the story of this Mexico Destination Wedding and we recommend turning the music up!